Keep a closer eye on your digits. 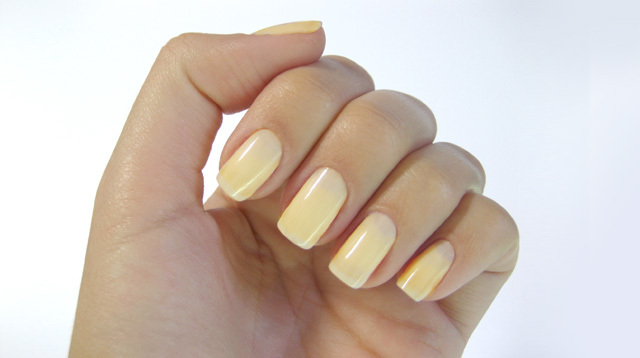 Get your nails checked if they still look this yellow sans polish! Temporary yellowing of your nails because of your polish is one thing, but if the discoloration hasn’t faded for months and your nails are starting to thicken, then it could be a sign of a fungal infection. You can get infected several ways: through unsanitized tools used during your mani-pedi, or using a communal shower (like at the gym) sans flip-flops. The infection can also spread just by scratching your feet if you have a skin condition, like athlete's foot. Nail infections are more common in people who smoke and live in hot or humid climates, so pay attention to your digits and have ’em checked by a licensed derma if their appearance is starting to concern you.